A story about the fight for equal rights in America's favorite arena: the baseball field! Every boy in the neighborhood knows Katy Gordon is their best pitcher, even though she's a girl. But when she tries out for Little League, it's a whole different story. Girls are not eligible, period. It is a boy's game and always has been. It's not fair, and Katy's going to fight back. 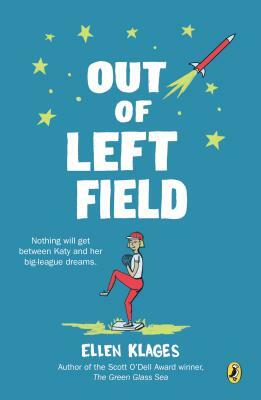 Inspired by what she's learning about civil rights in school, she sets out to prove that she's not the only girl who plays baseball. With the help of friendly librarians and some tenacious research skills, Katy discovers the forgotten history of female ball players. Why does no one know about them? Where are they now? And how can one ten-year-old change people’s minds about what girls can do? Set in 1957—the world of Sputnik and Leave It to Beaver, saddle shoes and "Heartbreak Hotel"—Out of Left Field is both a detailed picture of a fascinating historic period and a timelessly inspiring story about standing up for equality at any age. ELLEN KLAGES is the author of two acclaimed historical novels: The Green Glass Sea, which won the Scott O'Dell Award and the New Mexico Book Award; and White Sands, Red Menace, which won the California and New Mexico Book awards. Her story "Basement Magic" won a Nebula Award, and "Wakulla Springs," co-authored with Andy Duncan, was nominated for the Nebula, Hugo, and Locus awards, and won the World Fantasy Award for Best Novella. She is a graduate of Second City's Improv program, and has a degree in Philosophy from the University of Michigan, leading to many odd jobs that began with the letter P (proofreader, photographer, painter, pinball arcade manager). She lives in San Francisco, in a small house full of strange and wondrous things.